With more than 3+ million active installations, Yoast SEO is one of the most popular plugins for WordPress platform. There are more than 150,000 new downloads each day, and it doesn’t surprise that this free plugin is one of the first choices for new bloggers. You’re still not using #Yoast SEO for #WordPress? This is just the right time to start. Even if you are just starting out with WordPress, the chances are that you have already heard about this extension. But, why is Yoast SEO so popular? It is a well-known fact that WordPress is a great platform for bloggers. Without touching a thing, WordPress will make sure that your articles are optimized for search engines, and that others can get to your content without having to perform magic. Still, if you want your site among top search results in Google and other search engines, you will have to step up your SEO game. And this is where Yoast SEO becomes your best friend. For starters, the popular plugin automatically extends WordPress’ standard SEO features. Without you even knowing, Yoast SEO will optimize meta tags and other link elements that search engines read before showing results to users. It will also remind you to enable permalinks if your site isn’t optimized well. Yoast SEO will also let you control pages and decide if you want to hide specific ones from the public. Just sometimes, this option will be substantial. The most obvious help from the plugin shows up while you’re writing new posts. 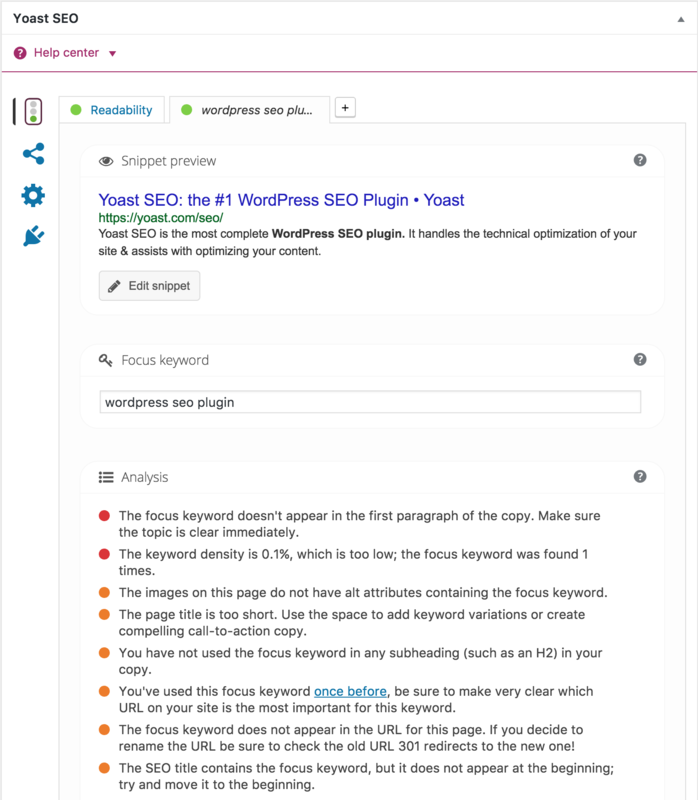 Yoast SEO continuously monitors your work and suggests improvements. For example, the plugin will let you know if you used a keyword correctly or not. It will count words for you and suggest writing better headlines. It will also warn you about other writing elements that can help you position the article on the search result pages. If you tend to write long sentences, for example, Yoast will advise to rewrite them. Yes, it will even mark the sentences in the post. While composing titles and descriptions, Yoast SEO will show you a preview of the snippet. So, even before going public, you’ll be able to emulate a search engine result. This is a much bigger deal than it seems on the first go because you get to see the output before it’s even wrapped up. Without a sitemap, search engines are left wandering through your site. Just by selecting one option, this fantastic plugin generates the map of your site so that Google can correctly read and index your website. You just can’t have a site without a sitemap. Today, a site isn’t worth much if it isn’t connected to social media. Folks at Yoast know that so they embedded settings for popular social media sites as well so you don’t have to worry about sharing content correctly. We believe that an SEO plugin is a must-have for every site owner. Although there are several popular ones, Yoast SEO is something you just shouldn’t miss. This amazing extension will help you position articles in search engines results which can help you grow your business and connect with even more people. Features we mentioned in this article are just the tip of the iceberg – install the plugin and start exploring its tremendous power. Once you get to know the plugin, you might also want to check the premium version which offers even better SEO control through WordPress. « Previous What Is Copywriting? Who Is a Copywriter? Next » What is an RSS feed? How does it work?